That’s the beauty of human intelligence. It is endowed with an innate ability to discover and learn. The world of a child is full of wonders, excitement and grasping power like none other, and, it is pertinent that we safeguard and nurture this ability if we look for excellence in him/her. As an educationist I believe that true education amalgamates a child’s fancy and an adult’s vision, it removes the dichotomy between ‘real learning’ and ‘mere schooling’. True education shoots over marks and medals and delves into the character and grit of a child. In the milieu of rampant technology, fancy gadgets, media glare and intermingled cultures, schooling has to transgress old definitions. Schooling has to be synonymous with discovery and growth, joy of leaning and knowing oneself. More than anything else, it has to treasure "values" above and beyond anything- values of Innovation, values of Teamwork and values of Perseverance. I feel delighted to witness bright and sensible youngsters at BBPS Rohini pursuing their dreams with utmost zest. The stalwarts who have sagaciously nurtured this institution have laid a strong foundation for them. Mr L.R. 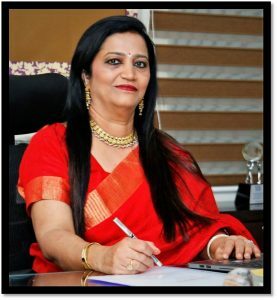 Channa, President, Child Education Society has been immeasurably dynamic and proactive in bringing about the state-of-the-art infrastructure and facilities to the school. The youthful synergy and prudence of Mr Kanishk Khullar, Chairman, BBPS Rohini facilitates a smooth sojourn for the school. It is with pleasure that I witness Bal Bharati Public School, Rohini marching ahead among the leading educational institutions under the able leadership of School Principal, Mrs Geeta Gangwani. The dedicated staff and bright students are a promise of a golden tomorrow. I hope the school continues to experience joy of learning with brightest hues of success.